a. Graduate from any reputed University in Statistics, Economics, Mathematics, Geography or Social Science. b. ISRT of Dhaka University or Higher Degree in Statistics from any Reputed University will be given preference. Education qualification: HSC passed from any Reputed Education Board with Statistics, Economics or Mathematics. Education qualification: HSC passed from any Reputed Education Board. Education qualification: Graduate from any Reputed University and 1 year experience. Education qualification: HSC passed from any Reputed Education Board and 2 year experience. f. Print the applicant copy A4 size paper and complete payment in Teletalk within 72 hours. Reply: Applicant’s Name, Tk-112/- will be charged as application fee. Your PIN is (8 digit number). Bangladesh Bureau of Statistics (BBS) authority will be notify by SMS your mobile phone when ready your Admit Card. You can login your User Id and Password and download Admit Card from www.bbs.teletalk.com.bd. Your Admit Card all information are mentioned Examination Date, Time, Venue and Details seat location. You can visit BBS Official website www.bbs.gov.bd for further information. After examination Bangladesh Bureau of Statistics (BBS) authority will published as soon as possible exam result. You may visit BBS Official Website www.bbs.gov.bd or www.bbs.teletalk.com.bd. 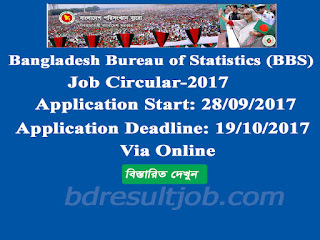 Tags: www bbs teletalk com bd, Bangladesh Bureau of Statistics (BBS) Job Circular 2017, Bangladesh Bureau of Statistics (BBS) Admit Card Download, Bangladesh Bureau of Statistics (BBS) Exam Result, Bangladesh Bureau of Statistics (BBS) Admit Card Download, BBS Exam Result, Bangladesh Bureau of Statistics (BBS) 3rd class job exam date, Bangladesh Bureau of Statistics (BBS) 3rd class exam result 2017, www bbs gov bd. 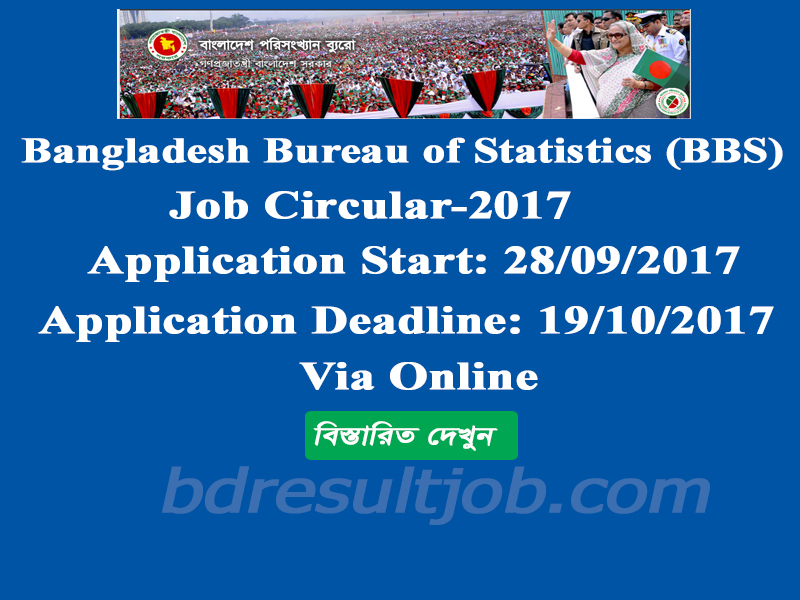 Bangladesh Bureau of Statistics (BBS) 3rd Class Job Circular 2017, Bangladesh Bureau of Statistics (BBS) 3rd class job exam date, Bangladesh Bureau of Statistics (BBS) 3rd class exam result 2017,Bangladesh Bureau of Statistics (BBS) Admit Card Download.